At the beginning of Obama’s term, Democrats controlled 59 percent of state legislatures, while now they control only 31 percent, the lowest percentage for the party since the turn of the 20th century. They held 29 governor’s offices and now have only 16, the party’s lowest number since 1920. At the heart of the Democratic Party’s troubles is its refusal to take a stand in favor of populism. Instead, it allows the forces of corporatism to direct the party’s agenda. 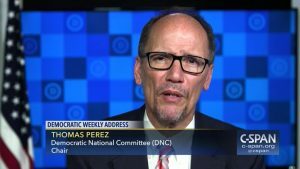 There has been a persistent infection afflicting the party since the days of the Democratic Leadership Council. Michael Corcoran explained how the DLC, which ascended with the success of Bill Clinton, became a tainted brand after revelations of sponsorship from such corporatist forces as the Koch brothers. Worse yet, the DLC agenda has been reincarnated through a “center-left” think tank known as Third Way. By late 2013, many astute commentators noted that Third Way’s board was heavily populated by Wall Street executives and other investment bankers. They are attempting to convince the party to shun its base and further embrace the so-called “vital center,” and the corporatism that has long defined these groups. According to an ABC News/Washington Post poll conducted on July 13, 2017, only 37% of respondents agreed that the Democratic Party actually stood for something beyond merely opposing Donald Trump. A national poll conducted by Bloomberg News from July 8-12, 2017, indicated that the net favorable rating of the Democratic Party has remained unchanged at 42% since before the 2016 election (specifically August of that year). The poll found the party’s unfavorability rating at a more-significant 48%. Donald Trump’s dismal approval ratings are obviously doing nothing to help the Democratic Party. On August 3, 2017, Quinnipiac University published results of a poll indicating 51% support for replacing the current health care system with a single payer system in which Medicare would cover every American citizen. Only 38% of the respondents opposed that idea. Corporatism is a system where businesses are nominally in private hands, but are in fact controlled by the government. In a corporatist state, government officials often act in collusion with their favored business interests to design polices that give those interests a monopoly position, to the detriment of both competitors and consumers. Democrats would be wise to avoid the mistaken belief in supporting Republican objectives as the only route to victory in “red” states. For example, many conservative pundits argue that Democrat candidates would be foolish to support single-payer healthcare when seeking office in Republican strongholds. However, Trump’s victory demonstrated that populist causes could resonate with Republican-leaning voters. The Democratic Party needs to develop the courage to become a champion of populism instead of corporatism.